This was a hit! The fairly picky six year old loved it and the extremely picky six year old liked it and ate it even though it was spicy to her. Success! I usually cater to them by not putting sauce on whatever I’m fixing in case they don’t like it but I threw caution to the wind tonight and I’m glad I did. 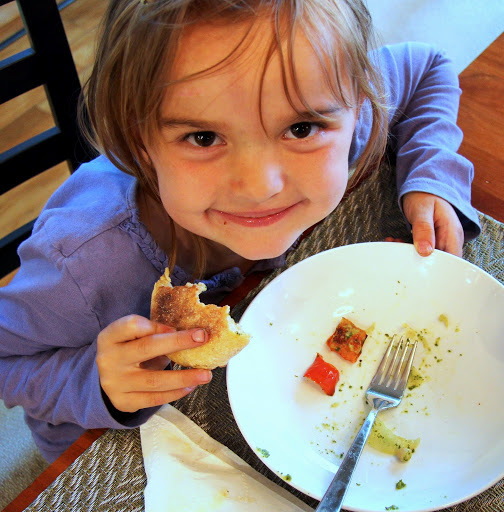 Yes, those are multigrain English muffins… we had no need for fancy bread with our Monday night pasta dish. Get ready for some serious garlic breath. That’s a good thing though because raw garlic is super good for you. It helps to detoxify the body, it’s a natural antibiotic, it helps reduce disease causing inflammation, it improves blood flow, and it has high levels of essential B and C vitamins and minerals such as magnesium, selenium and potassium. All that and it’s tastes sooo good! Just make sure everyone else is eating it too. And make sure you eat it raw as often as you can because cooking it destroys a lot of it’s benefits. 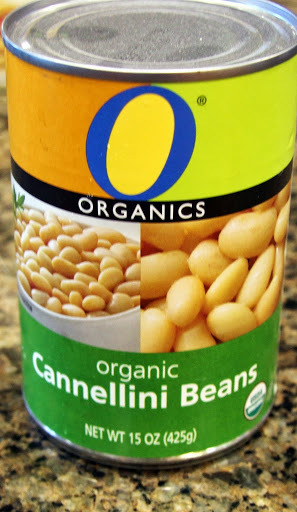 Cannellini beans are high in fiber, iron, protein and I love their creamy texture. 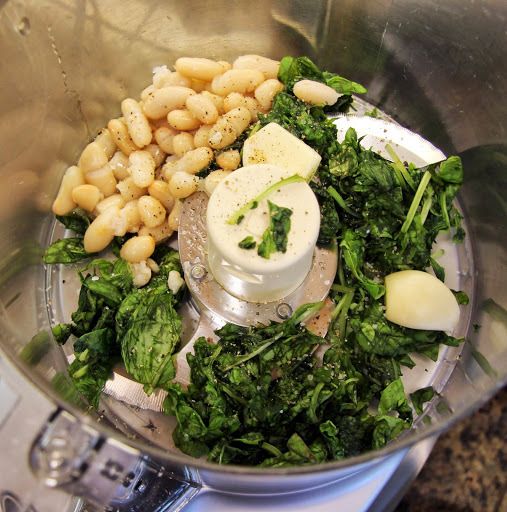 I don’t use pine nuts in my pesto because Ella has a tree nut allergy and might be allergic to them (Even though they’re technically seeds, I don’t want to find out the hard way) so adding in some of the beans provides a similar texture. 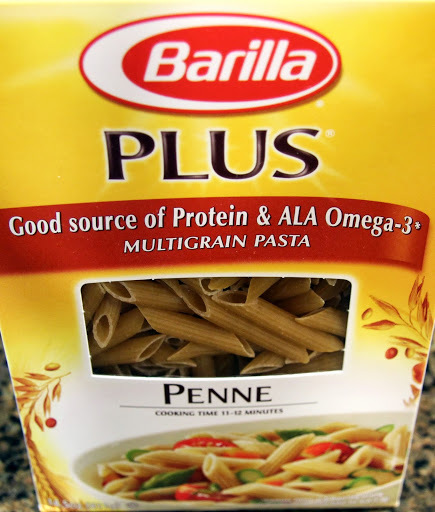 I use Barilla Plus multigrain pasta to add even more fiber and protein so this is a great meatless option. 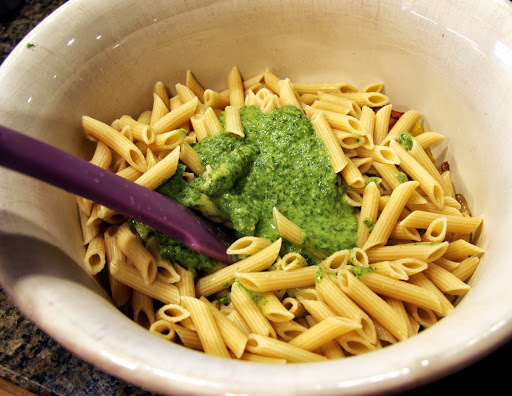 You could use regular semolina pasta too and still have a healthy dish if you can’t stand the slightly different texture (at least it’s not nearly as crunchy as regular whole wheat pasta). 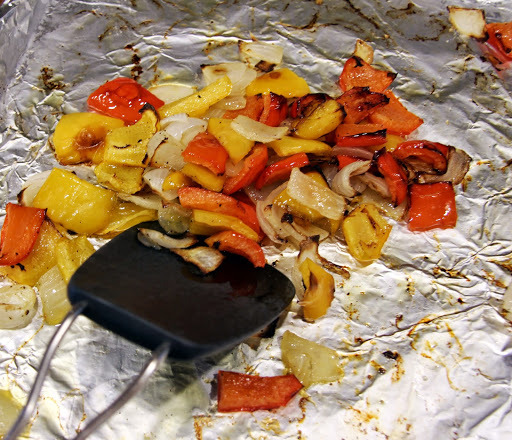 The onions and peppers become almost buttery and sweet when roasted and make for a perfectly balanced flavor combination in my oh-so-humble opinion. 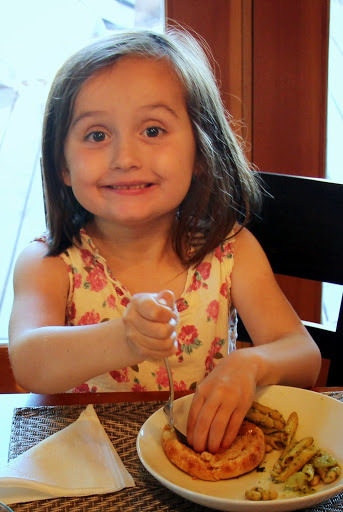 I hope you enjoy it as much as Hailey (fairly picky six year old) did. Preheat oven to 425 degrees, 400 degrees if using convection oven. On high heat. 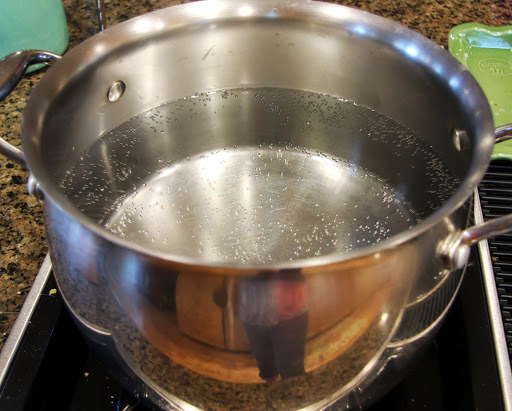 bring a large pot of water to boil for your pasta. 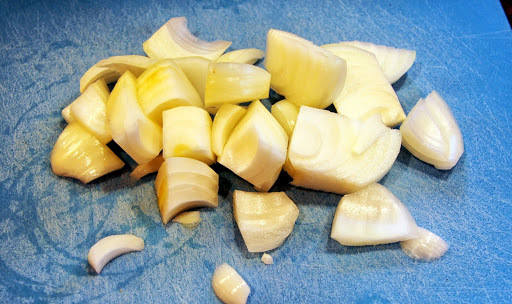 Chop onion and peppers in medium/large chunks, making sure they’re all roughly the same size. 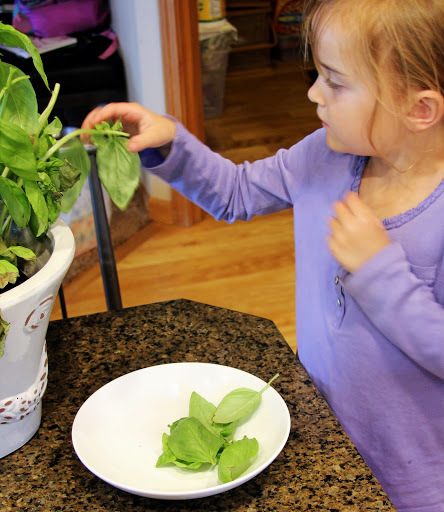 Get your small helper started on picking basil leaves off the Trader Joe’s plant that will die if you don’t use it now. No helper or Trader Joe’s plant? Fine, get your package of basil out, you’ll need it soon. 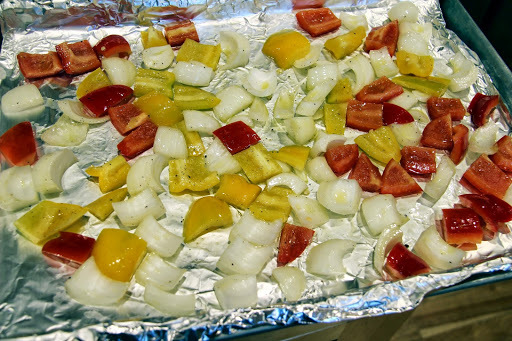 Line a half sheet pan (aka jelly roll pan) with aluminum foil. 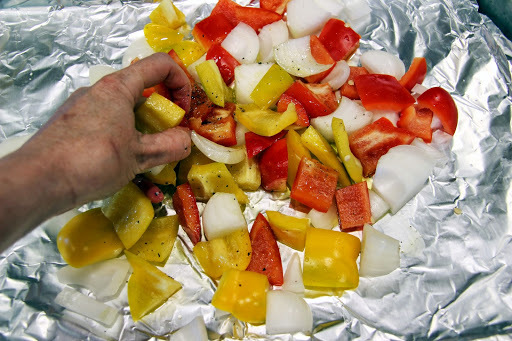 Place onions, peppers, 2 TB olive oil, pinch of salt and pepper on foil and mix with your fingertips until the veggies are coated with olive oil. Spread evenly on pan. 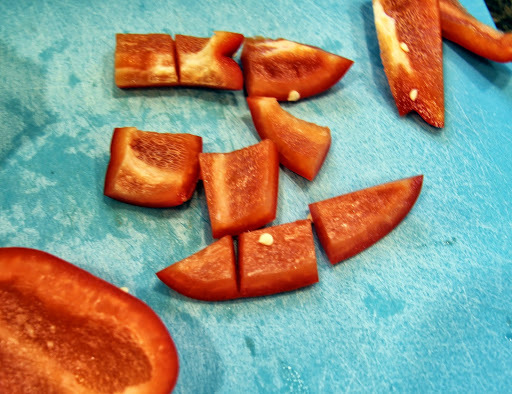 Place in preheated oven for 20 – 25 minutes or until they begin to caramelize. 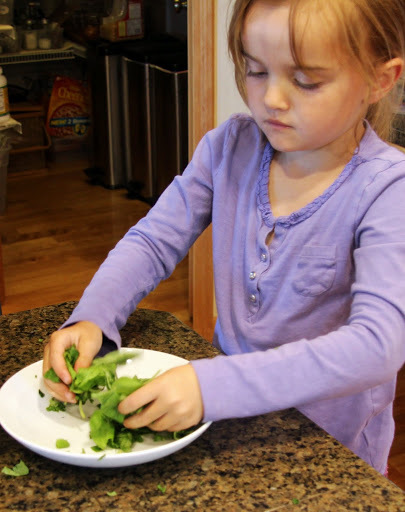 Let your helper know that although you appreciate her help, she should stop playing with the basil now. 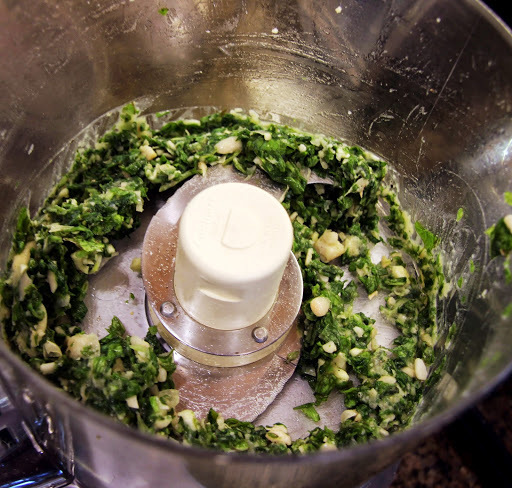 Yell at her for not listening and place your bruised basil in a food processor or blender. Apologize for raising your voice and get a grip, it’s going to be pulverized anyway. 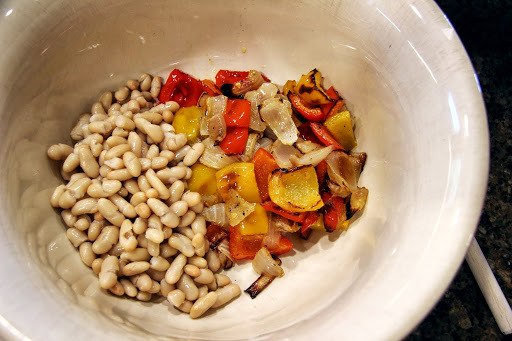 Also place 1/4 cup of the beans (set the rest aside for later), the garlic, lemon juice, salt, black pepper and red pepper in the bowl of the food processor/blender. Pulse, scraping down sides as needed. Add 3 TB olive oil and blend until smooth. 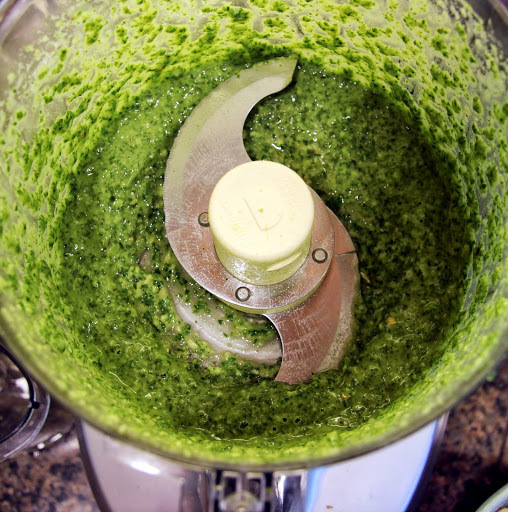 You should end up with 1/2 cup of pesto. 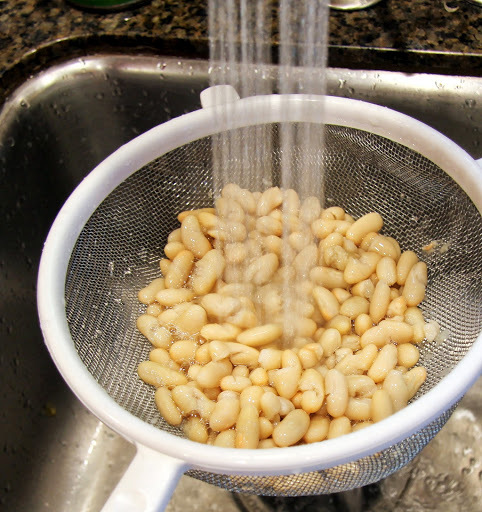 The pasta water should be boiling by now. 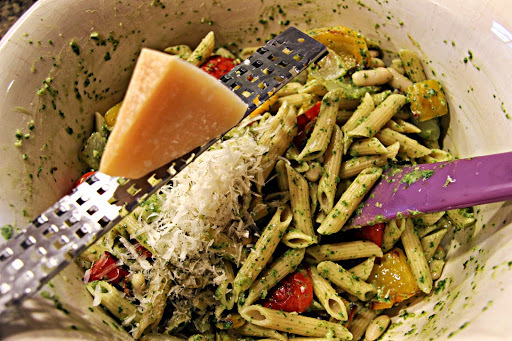 Add your pasta if you haven’t already and cook according to package instructions. 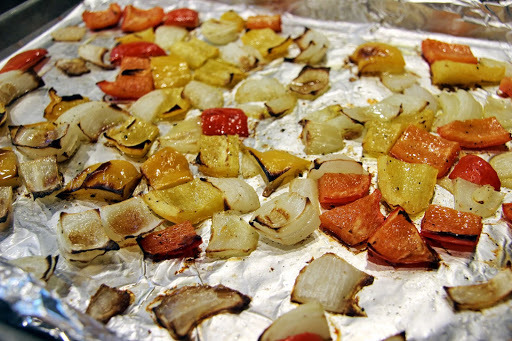 Remove your beautifully caramelized veggies from the oven. 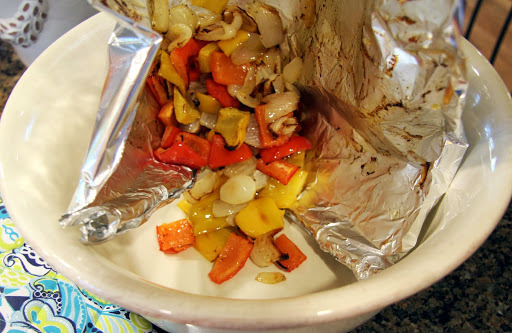 Slide them off the foil in to a large mixing/pasta bowl. Be happy you don’t have to clean the pan! 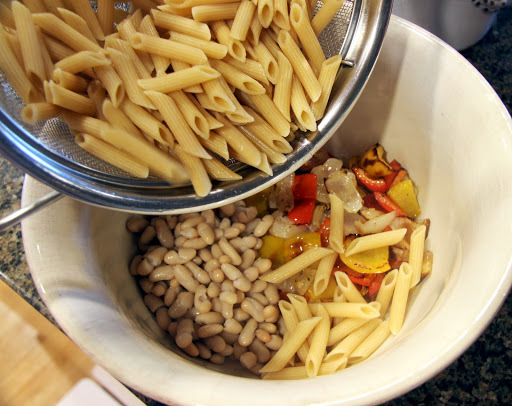 Add remaining beans and cooked and drained pasta. 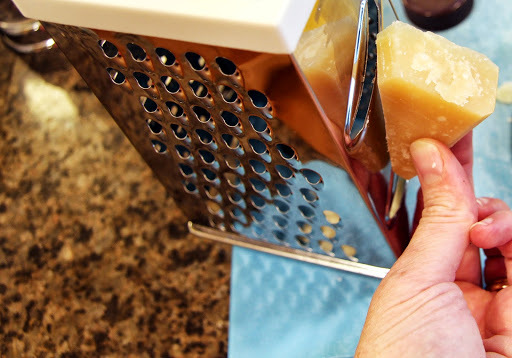 Grate about 1/4 cup of parmigiano reggiano or other parmesan cheese and stir in to pasta. To get some fancy shavings, use the two slits on the skinny side of your box grater. Serve warm, room temperature or cold from the fridge. It’s all good. Like everyone, my thoughts are with those who experienced unbelievable devastation in Oklahoma today. I’m not religious but I strongly believe in the power of prayer. Join me in sending love to all who are suffering. 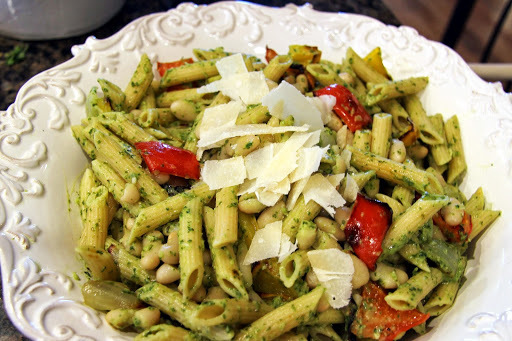 I just can't wait to try this dish especially because you didn't use pine nuts in the pesto so I wonder how different the taste would be. 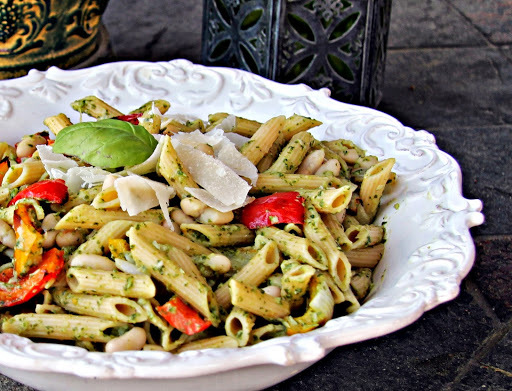 I love pasta mixed with different things and I know this will go down a treat. A very colourful looking dinner too. My heart and condolences also go out to those in Oklahoma. I heard about it this morning a couple hours ago. So sad. I think I'll make this for our last-minute dinner party tonight. Time to go to the store!